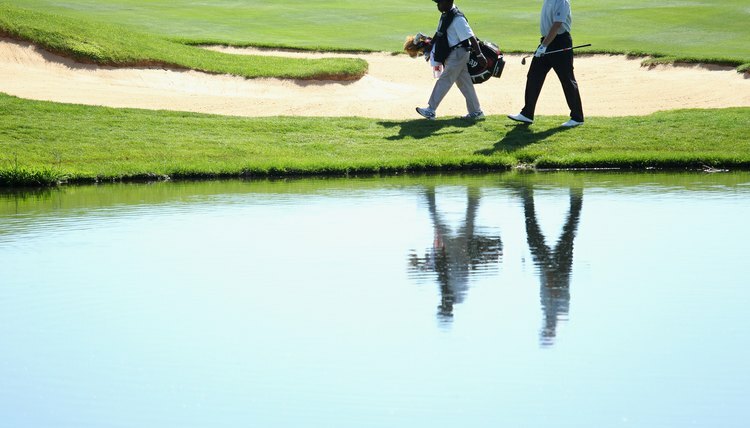 Tour player Ernie Els walks with his caddy during the 2011 South African Open Championship. Whether they are caddying for golfers during the weekend at the local country club, or carrying the bag of golfers who are playing in major tournaments and competing for thousands of dollars, the responsibilities of golf caddies are largely the same. Carrying golf bags and handing golfers their golf clubs are among the most visible aspects of the job of golf caddies, but there are many more responsibilities. The main job of golf caddies is to carry the golf bags of golfers. In some instances, golf caddies will carry the bags of two golfers. In addition to carrying the bags, caddies also hand golfers the various clubs they use, and put clubs back into the bag after golfers have hit their shots. Golf caddies are expected to clean the golf clubs and golf balls of the golfers for whom they are caddying. Many golf courses include mechanical club and ball washers, but caddies also should carry a towel and use it to wipe clubs after each shot. Caddies most commonly clean golf balls on the green and at the beginning of each hole. Caddies are responsible for raking bunkers and sand traps. This responsibility kicks in after golfers hit their balls into bunkers or sand traps, forcing them in to the sand. Caddies should rake the entire disturbed area. Golfers often want to know how far it is from the ball to the green; it is the job of caddies to tell them. Some caddies use an automatic range finder, but the most common method for measuring the distance is to find the nearest distance marker. These are located in the fairway and have written on them the distance to the green. By pacing off the distance from the golf ball to the marker, then adding or subtracting it from the distance on the marker, caddies can tell golfers the distance to the green. When golfers make divots on the fairway or in the rough, caddies are responsible for replacing them. Caddies retrieve the chunks of grass and place them in the spot from where they came. Once golfers have hit their ball onto the green, caddies are responsible for tending or removing the pin. If the golfers cannot see the hole from where their balls are, caddies stand near the pin, hold it in one hand, and remove it only after the golfers have hit their shot. If the balls are near the hole, caddies should remove the pin before any putts are hit. The pin must be replaced once all golfers have hit their ball into the hole.